Attractive and interesting flashcards are a great way to introduce new words and practice your child’s vocabulary. Explore fall themed vocabulary cards and play fun games with your kids. 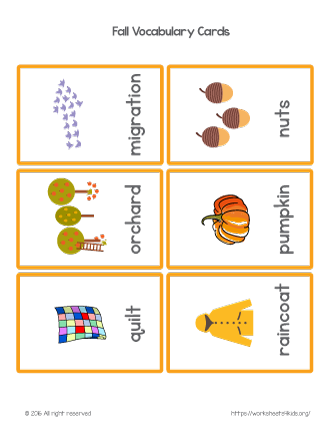 This set includes words: migration, nuts, orchard, pumpkin, quilt, raincoat.